We offer a wide selection of drawer inserts to organize your work areas. 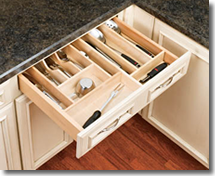 Imagine all of your utensils and spices within easy reach! There are a variety of material choices out there, so consider durability, ease of cleaning and aesthetics. Wood is always a great choice as it will most likely match your existing drawer material. Plastic is easiest to clean as you can simply pop it in the sink or dishwasher, and it’s fairly durable, too. Metal or wire organizers will be durable. 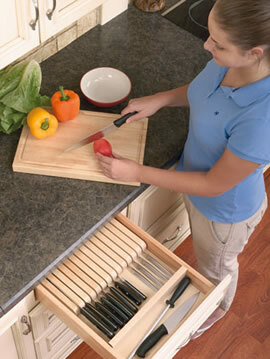 Use drawer dividers for larger items like spatulas, tongs and stirring spoons. A cutlery tray is perfect for dividing up forks, knives and spoons. You can use one to separate with adjustable dividers to allow you maximum customization. Drawer boxes are a great option for mixing and matching different sizes and heights. 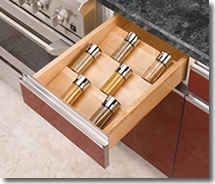 You will also be able to add a spice organizer to one of your drawers, which frees up valuable counter or cabinet space.